With open heart surgery being initiated at the Jaffna Teaching Hospital this month, bypass operations are to be launched in about two months. 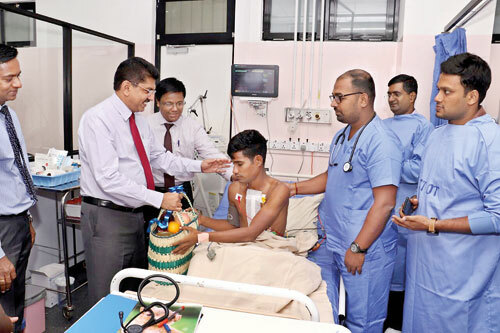 All arrangements are being made to begin coronary artery bypass grafting (CABG) at the Jaffna Hospital, the Director-General (DG) of Health Services, Dr. Anil Jasinghe who paid a visit to the hospital soon after the first two surgeries on December 20 and 21, told the Sunday Times. The Director-General of Health Services, Dr. Anil Jasinghe presents a basket of fruit to one of the patients who has undergone open heart surgery for a closure of a hole in the heart, while Consultant Cardiothoracic Surgeon Dr. Mugunthan Sithamparanathan and his team look on. The Jaffna Teaching Hospital launched open-heart surgery for the time in mid-December. “We have made arrangements to send perfusionists on a rotational basis from the National Hospital of Sri Lanka (NHSL) and the Kandy and Karapitiya Teaching Hospitals to the Jaffna Hospital, until permanent perfusionists are appointed there,” said Dr. Jasinghe, adding that the way is being paved for more and more open heart surgeries at Jaffna with the support of Health Minister Dr. Rajitha Senaratne. Perfusionists are essential members of the cardiac surgical team when performing open heart surgery using the heart-lung machine (cardiopulmonary bypass machine which takes over the functions of the heart during the operation). With heart disease being the No. 1 killer in Sri Lanka and the world, CABG would help numerous patients in the Northern Province. CABG improves blood flow to the heart in patients who have severe coronary heart disease and whose coronary arteries have a heavy build-up of plaque. Such a plaque build-up narrows the coronary arteries and reduces the flow of oxygen-rich blood to the heart. If the plaque ruptures, it can set off a blood clot which can block the blood flow in a coronary artery, causing a heart attack. In CABG, a healthy artery or vein from the body is connected, or grafted, to the blocked coronary artery, bypassing the block and creating a new pathway for blood to flow to the heart muscle. Dr. Jasinghe also assured that more Intensive Care Unit beds would be dedicated to patients who have undergone open-heart surgery at the Jaffna Hospital. The first two open heart surgeries at the Jaffna Hospital were to repair holes in the heart (atrial septal defects – ASDs) of a man and a woman. They were performed by a team headed by Consultant Cardiothoracic Surgeon Dr. Mugunthan Sithamparanathan with the support of the Anaesthetic Team, the ICU doctors, the Cardiology Team, the Perfusionists, the Nursing Team and the Health Assistants. There is good news for all heart patients on the list of the National Hospital of Sri Lanka (NHSL), the premier heart centre, as the country greets the New Year.While one of the Operating Theatres (OTs) of the NHSL’s Neurotrauma Unit is being utilised for open-heart surgery — as a temporary measure until repairs to the Cardiothoracic OTs are concluded — arrangements have also been made to use the OT of the Transplant and Epilepsy Building for four days of the week for heart operations along with an area converted to a four-bed Intensive Care Unit (ICU) on the same floor, the Sunday Times learns.“Another measure is to transfer three to five patients requiring heart operations to the Sri Jayewardenepura Hospital every week, with the cost of these operations being borne by the government,” NHSL’s Acting Deputy Director-General, Dr. Kumara Wickremasinghe told the Sunday Times yesterday. Explaining that these measures have been facilitated with the support of Health Minister Dr. Rajitha Senaratne and the Director-General of Health Services, Dr. Anil Jasinghe, he said that this follows the closure of NHSL’s four Cardiothoracic OTs due to repairs.The repairs to the two Cardiothoracic OTs and the ICU located in the Cardiology Unit being carried out by the State Development and Construction Corporation (SD&CC) are expected to be concluded by the end of January, paving the way for the resumption of open-heart surgery, he assured, adding that the balance repairs to the two Cardiothoracic OTs and ICU sited within the main NHSL complex are to be handled by the army.These measures follow in-depth discussions among Dr. Senaratne, Dr. Jasinghe and Dr. Wickremasinghe with the NHSL’s Cardiothoracic Surgeons and Cardiac Anaesthetists, it is learnt. Meanwhile, a proposal to channel patients needing open-heart surgery to private hospitals with the government footing the bill had been discussed but set aside as “not being a feasible option”. Let’s wish ourselves a dengue-free 2018!